The game lasts from June 22 through June 29. Learn more and submit your entry here! I’m also going to be running a giveaway of my own, so be sure to check out the info about that at the bottom of this post! 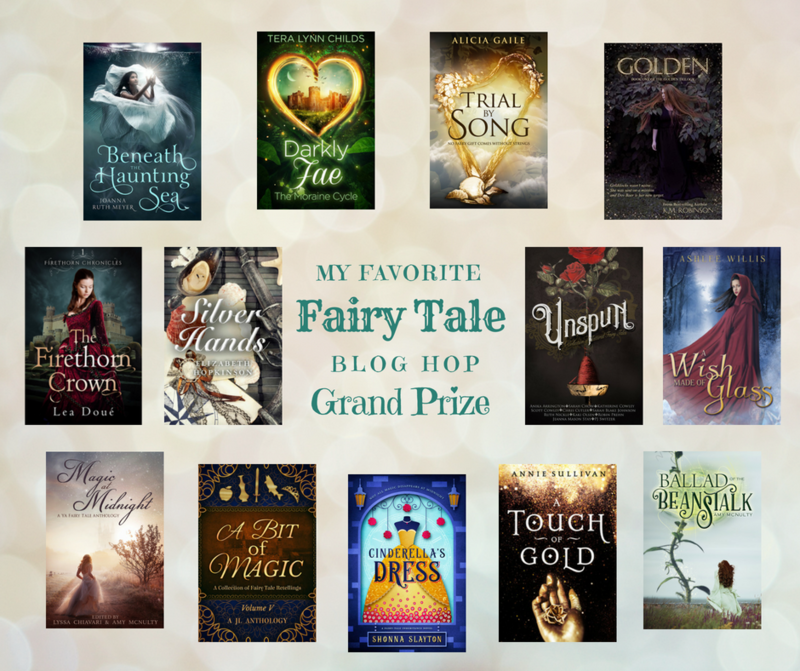 During the blog hop, we’re each going to be talking about our favorite fairy tales. The only trouble is… I can’t pick just one! Having grown up with Disney movies, Barbie movies, and fairy tale retelling books like Ella Enchanted, Entwined, and Ash, I have a lot of different favorites with a lot of different spins on each one. So I thought it might be easier to name my favorite Fractured Fairy Tales. There were also some Fractured Fairy Tales later on in the series that I think may have been original stories, such as Prince John and Princess Tinsel (a couple that annoys a witch so much that she turns the princess into an ogre—but the ogre cooks so well that the prince, the ogre and the witch wind up forming a happy little family) and a very cute story about a witch who falls in love with a handsome prince, turns herself into a princess, but is almost given away by her faithful broomstick. Maybe these are based on more obscure fairy tales that I just am not aware with, but either way I just love them. I could honestly go on listing favorite Fractured Fairy Tales all day, so maybe I didn’t do a very good job narrowing this down after all. So I’ll just say that you should check them out—most of them are on YouTube (I couldn’t find John and Tinsel, though), and Amazon also has all the Fractured Fairy Tales on their own, separate from The Bullwinkle Show, available to buy in Instant Watch. Don’t forget to check out all the other authors’ blogs in the scavenger hunt to find their secret numbers and enter for a chance to win all the participating authors’ books in paperback format! One of the books you have a chance to win is Magic at Midnight, the anthology I edited this spring with 15 different stories to enjoy! If this is the last blog you’re visiting in the scavenger hunt, be sure to head over to Shonna Slayton’s website to enter for the prize now! You’re still here? I haven’t scared you away with all these Jay Ward cartoons? Then how about a bonus giveaway to reward you for your time? I’m going to be giving away an ebook prize pack to one lucky winner. This will include an ebook of Magic at Midnight, plus a bonus ebook that features all the other fairy tale retellings I’ve written so far (you may already know about “Seven Years Among Dragons”, but I’ve also written a few more that have only been made available on Patreon as of now). Enter below! I found “John’s Ogre Wife” in a couple of places online. I think that is the episode with Prince John and Princess Tinsel (https://www.bcdb.com/cartoon-story/7956-Johns-Ogre-Wife). It vaguely reminds me of “Jorinde and Joringel”, but isn’t a close parallel. That’s it! No wonder I couldn’t find it, I was looking under the wrong name! Thank you! He he! Hansel and Gretel made me laugh! I need to log off now but will come back for the rest! Came back for Rumplestiltskin – love it! I’ve never come across these videos before! I love fractured fairy tales.